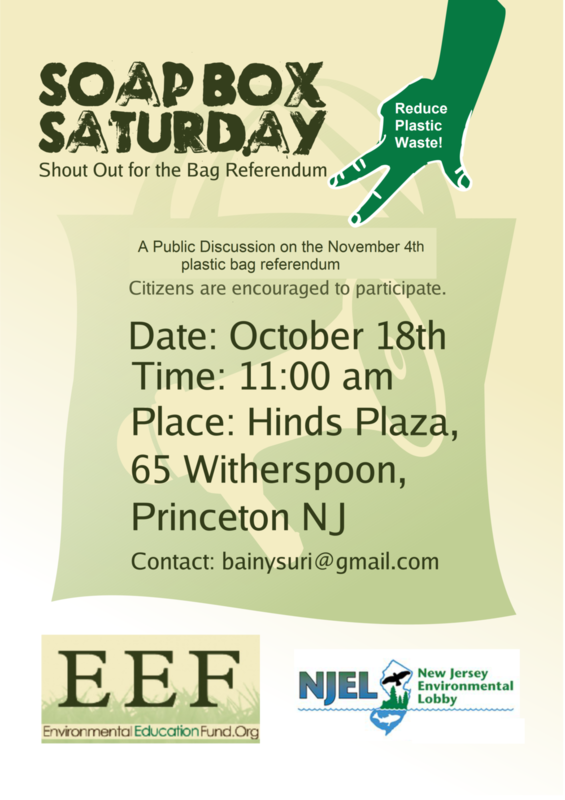 Stop by Hinds Plaza in Princeton on October 18th at 11:00 AM for an opportunity to share your opinion about the non-binding single-use plastic bag referendum that will be on the ballot for Mercer County residents on November 4th, 2014. Speakers of all ages are welcome to come and speak for two minutes about the referendum or single-use plastic bags. Click here to read about Resolution 2014-454 and the non-binding referendum. The event, which is rain or shine, is sponsored by the Environmental Education Fund and the New Jersey Environmental Lobby. Contact Bainy Suri at bainysuri@gmail.com for more information.